So as I started to emerge from the bubble of the last few months, I have realised that it is time for me to take on a structured weight loss and fitness challenge, and stop taking my health for granted, so I’m looking at Terrafit. We have now booked a summer holiday for August, and it is time for me to put myself first and try to get into some sort of shape. I don’t want to do any kind of turn up and weigh class, nor anything where you have to count calories, points or syns with each meal. Life is too short to obsess about food and weigh everything. My time with Thinking Slimmer has taught me that detailed food diaries are too complicated and counterproductive for me, and I now flatly refuse to do anything that means you have to cut out completely any category of food, however bad, because I know the cravings will always get the better of me. So I will be back on my trusty Slimpod regime, listening to Trevor and recording my daily positives, but I’ve also been looking for a little bit more to spur me on, get me motivated and most importantly get me moving. because exercise is where I fall down every time. I hate it but I really need to do more of it. It’s in this frame of mind that I stumbled across Terrafit. Terrafit is run by the DoTERRA company which sells essential oils through Independent Wellness Advocates, but it is a separate thing, and although some coaches use Terrafit to boost their essential oils business, you can do a Terrafit challenge without buying anything from doTERRA if you don’t want to. They offer a series of 12 week weight loss challenges where you sign up with other people, join a Facebook group and compete to get the most points and win prizes. They also do 3 week challenges – I am on one now as a trial and loving it, but the next 12 week challenge starts on Monday 8th May and I have signed up already. What’s involved in a Terrafit challenge? When you join a Terrafit challenge you either choose to join a team or you get allocated to one. At the moment I’m in a team with 5 American ladies (this hasn’t really hit the UK big time yet, although I think it might). 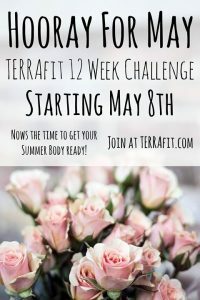 For the 12 week challenge I am setting up a team of my own called the Terrafitties, and I really hope that some of my friends will decide to join me on this (and maybe bring some of their friends along too). The challenge costs $25 (although you can save 15% if you join my team and use the code ‘hooray’) – this gives you access to the team portal where you log your points, and a Facebook group where you and your team can motivate each other. Some of the entry money goes into a prize pot too – if you want to compete properly you have to submit a dated before picture and dated after picture and there are substantial prizes to be won. There are individual prizes and also team prizes , so there is an incentive for the team to pull together and motivate each other. 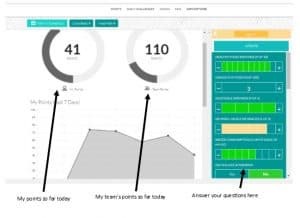 Each day you have a dashboard to complete – you answer a series of questions and you get points for the healthy things you have done. There are points for eating up to 10 healthy items from a list of good foods, including lean meats and fish, dairy, fruit, vegetables, seeds grains and other good foods. You don’t have to keep a food diary – just make sure you add a couple of servings of the good guys in at every meal. Then there are bonus points if 4 or more of your healthy food items are vegetables – you gotta eat your veggies…..
You get points for each glass of water you drink as long as you drink more than 6. You get points for doing 30 minutes of out of breath exercise on 5 days out of 7, and points for resting on the other two official rest days. There is an app with lots of suggested video workouts – you get a free month’s trial and then a monthly suscription which is optional. So far I have tried out a 30 minute yoga class and a core workout class which have been great fun. They have plenty of classes that need no equipment and some which need weights and things. I think there is something for everyone in this app, but if you want to cancel it and just do your own 30 minute workout then that is fine too. There is a daily challenge each day which gets you points too – so far it’s been about goal setting, finding an accountability partner and similar. All very simple and fun to do . 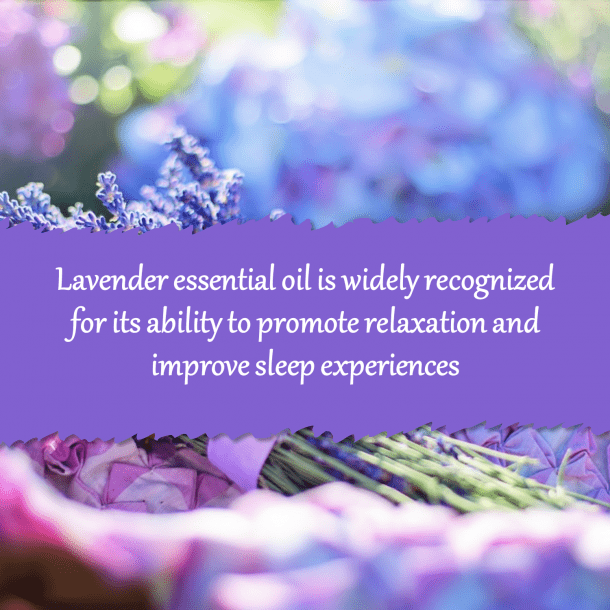 There are also a small number of points for using certain supplements – mainly based around essential oils (which you can buy from doTERRA or source yourself). You don’t have to use any of these but I will confess I have bought the lemon essential oil and the metabolic blend oil, and they are both amazing and better than other essential oils I have bought elsewhere. I’m diffusing them in the air as I work and also adding the lemon to my water (they are guaranteed food grade), and I certainly feel uplifted, perky and full of energy, which is a big change to the last few months. There are meal replacement shakes and bars available but I prefer not to go there, and nobody is pushing me to. There are meal plans and recipes available if you want them, but you don’t have to follow them. The coaches recommend that you split your food up into six small meals and don’t eat after 8pm. I’ve been managing 5 small meals – I would have a sixth snack normally but it would be after 8pm and so far I have resisted. So each day you see your points and your team’s points and you get to chat and share things among yourselves in your Facebook group. I’ve been getting typically between 60-70 points out of 100 this week and it seems my other team mates are likewise. Some of the teams advertise themselves as competitive and I think they push people to get a perfect 100 every day, but my team for the 12 week challenge won’t be that way. I want to lose weight, eat healthily and get fit but I want to have fun and have a life too and I don’t mind if my weight loss is slow. All in all this looks like a great weight loss framework for me and I’m really looking forward to doing the 12 week challenge, and hopefully persuading a couple of my friends or maybe even some famiy members to join me. 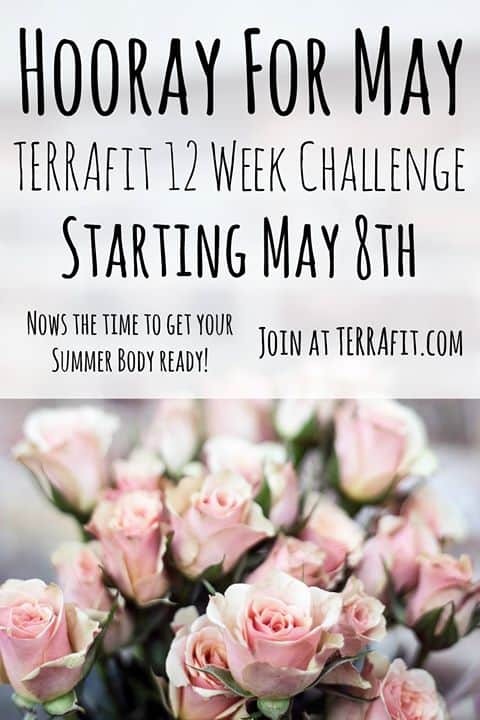 Please take a look at Terrafit yourself, and if you like what you see, please come and join the Terrafitties for a challenge that starts on Monday 8th May for 12 weeks. We are going to have some fun in the next few weeks and hopefully uncover that amazing summer body too. Sounds just what I need Debbie, I have signed up.